For ceiling height under 26’ (792cm), EZ Fold backstops may be operated by a manual winch with a removable handle. The winch features maintenance-free sealed gear case with a 40:1 worm gear ratio to provide 1,000 lbs (454 kg) vertical lifting capacity. The cable drum has a 4" (102mm) diameter and is grooved for 1/4" (6mm), 7 x 19 aircraft cable provide to proper spooling. Cable drum is enclosed by removable cover. Winch can be operated with standard removable handle or optional Electric Portable Operator. 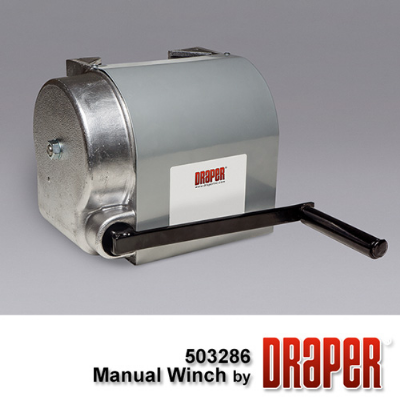 Winch has a five-year warranty.